Public health policies during the Soviet period eliminated several traditional diseases. But for lack of adequate investment in medical equipment and drugs in the 1970s and 1980s they failed to effectively halt a worrying rise in the death rate, for infants and for the population as a whole. 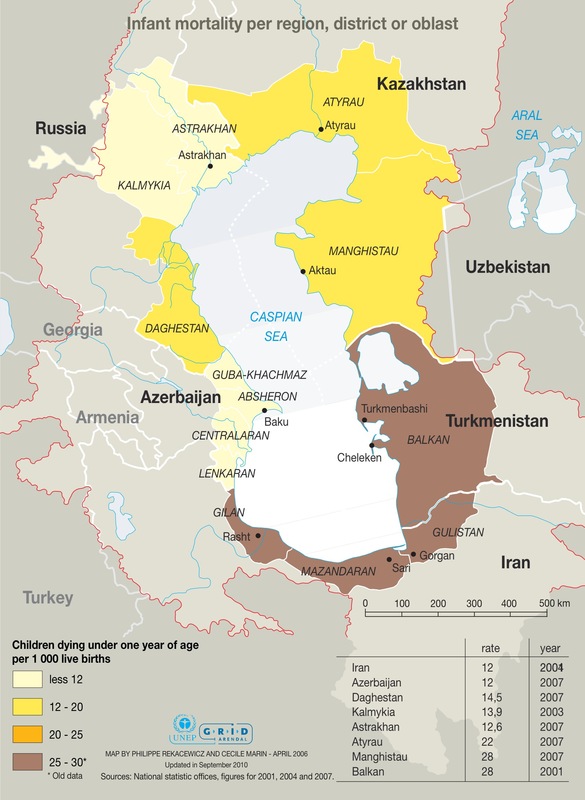 This setback is very noticeable all over Russia, but in much of the Caspian basin it went hand in hand with a shortage of amenities, due to the distance from the country’s main economic centres. Several additional factors have contributed to the emergence of new health problems, in particular the increase in perinatal or infant mortality, the reappearance of diseases such as tuberculosis or polio that had almost been eradicated, and an increase in the number of hepatitis and cholera foci. In Azerbaijan, the highest morbidity rate is related to diseases of the respiratory organs (11 274 cases per 100 000 people), with a similar situation in Atyrau and figures twice as bad in the Mangistau oblasts, linked to exposure to pollution. There are still problems obtaining a supply of good quality drinking water, except in a few hilly regions. In the country and in many cities the water pipes and sewage systems are urgently in need of improvement, contributing to unsatisfactory public hygiene. Azerbaijan’s programme on Poverty Reduction and Economic Development also recognizes that one of the primary causes of morbidity and mortality in children is diarrhoeal disease, usually caused by contaminated water. Furthermore the number of industrial facilities with a high risk of pollution is tending to increase due to exploitation of new oil and gas fields. The concentration of heavy metals and toxic or even radioactive materials is a recurrent problem in old industrial centres such as the Absheron peninsula. 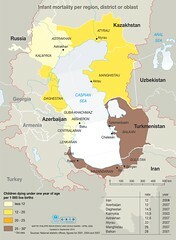 Similar sources of pollution have existed since the 1960s and 1970s in the west of Turkmenistan and in the Astrakhan and Atyrau areas. Little is known about the radiation exposure of people living in areas of high radioactive pollution, in the Atyrau oblast, home to a former nuclear testing site. For any form of publication, please include the link to this page and give the creator credit (in this case Philippe Rekacewicz (le Monde Diplomatique) and Cecile Marine) If the high-resolution file is not available, please contact grid@grida.no for request and permission for usage. Supporting the Interim Secretariat with the implementation of the Convention Program of Work and the organization of COP6.